Clearing to the northwest behind samford, nasty commute home right now though. Home from university, I worked a bit, answered a few emails, and then started to think about packing. My father-in-law, Dale Cardwell, tested out our light setup and mounted the slow moving vehicle sign on the back of the car. About 2PM, I started throwing all my spare bike equipment into the back of the car. I took my Scott Addict as a backup bike, two extra Martindale wheels, a floor pump, my normal on-the-bike toolkits, and my normal travel tool bag. I also put in a couple extra bib shorts and jerseys. At the last minute I decided to throw in my lighter winter jacket just in case, but I was thinking that temps would stay in the 50s the whole race so I thought leg warmers and arm warmers would be enough. I was really wrong about that as temps plummeted to 32 degF on the descent off Lookout Mountain just before sunrise. “Stopped by Brick Alley to pick up my backup bike for Friday.” I rode the 3 miles home from the shop carrying the Scott. Then I realized I was running late for picking up the kids from school, so I dropped the bike in the front yard and then took off through the woods to meet and walk home with the kids. Stopped by Brick Alley to pick up my backup bike for Friday. Love the irony of biking to the auto parts store to pick up all the follow vehicle equipment required for the race. Nevertheless, I thought everything was on track for our Friday departure until I went to put in all my nutrition. The car was packed with a lot of stuff for Dale and my wife Kristine for 30 hours in the car. I wasn’t sure where to put the nutrition so that it was easy for them to grab and hand to me out the window of the car. At this point I had an inkling that this was not going to go quite as smoothly as I had imagined in my head for weeks. I put some gatorade bottles on the front passenger seat floor and a box with powerbars and powergels on the middle row of seats thinking that whoever was in the passenger seat would be able to turn around, grab what I needed, and hand it to me out the passenger window. My parents were coming over to pick up the kids and keep them for the weekend while Kristine, Dale, and I drove over to the pre-race meeting at 3:30 only 3 miles from our house at the Colonnade. But they couldn’t be there until 3:20, so we decided to go to the meeting without Kristine. At the last minute as we were driving away, my parents drove up so we scrambled to get Kristine in the car and get to the meeting on time. Smooth sailing on the drive and we walked into the meeting at exactly 3:30 and were pretty much shocked at what we saw. I thought there would be five or six people in the room since I thought there were only two other racers and everybody would have a similarly sized crew of two people. Well, there must have been 20-25 people in the room with 4 other racers (5 total) doing the race! “500 mile pre-race meeting, getting real now!” Race director Tom Robertshaw was standing up in the blue shirt giving the pre-race instructions while I instagrammed this pic below. Most of his instructions were route related and brief review of the UMCA rules regarding lights. 500 mile pre-race meeting, getting real now! One thing that came up that I had missed in the rules was required reflective tape or stickers on the wheels and cranks. I did not have anything reflective on my bike. We stopped by a hardware store on the way home and bought some reflective tape, but I remembered that I had bought some reflective stickers years and years ago to put on my helmet. I found the leftover stickers and thanks to Kristine’s suggestion and help, I used clear packing tape to secure about 10 stickers per wheel and 3 stickers per crank. This took a surprisingly long time, at least an hour to put all the stickers on both sides of my four wheels. I wasn’t sure how well it would hold, but it was both aerodynamic and amazingly secure. Only hiccup so far – didn't have required reflective tape on the wheels and crank arms. Fixed! Towards the end of the pre-race meeting, Tom indicated that we would be starting in 2 minute intervals starting at 8pm. He asked for volunteers to go first, and I shot my hand up as fast as I could realizing that it was going to be challenging enough for my crew without us having to pass other teams and their support vehicles. I didn’t know what to expect out of the other racers including a rider from Italy, but I figured that I might be the fastest given that I had a realistic shot at the record and that the record has stood for so many years. That’s the one downside of living so close to the start and timing everything so close – I didn’t really have an opportunity to meet the other riders. There was a total of five racers, and I believe I met three of them. Everybody was super nice and offered to help. It was not nearly the cut-throat mentality I had imagined ultra-endurance racing would be. With the car being packed full, there wasn’t a lot of room for my bike. I decided that it would be easier if I simply rode to the start – about 3 miles down Acton Rd. I realized a flaw in this plan about halfway there because I didn’t have any tools in case of a flat or problem. Fortunately, no flats for the short ride and, furthermore, no flats or mechanical problems of any kind for the next 500+ miles either! When I arrived at the start, I saw the RVs of two of the other racers and then saw Kristine, Dale, Pat Casey, and Heather Hagan near the parking lot entrance. I rolled up at about 7:40. Race director Tom came right over and inspected my bike to make sure it had all the required reflective material – check! Then we took pictures. During that time Chris Shelton came over right as we were mounting the “Caution Bikes Ahead” sign to the back of the car, which turned out to be Chris’s sign he had loaned to Tom a couple years ago. Five minutes to go and Heather took this picture with my phone, I instagrammed it really quick, and a minute or two later I was off! 5 min to start, lets do this! The course started out down Blue Lake Rd and turned onto Sicard Hollow Rd, which has several steep rollers. Dale was driving first, and it took a while for him to adjust to my sudden changes in speed as the road rolled down and then back up. I really wanted to hit the descents hard in order to take the climbs easier, but the negative consequence of this was my speed dramatically changing throughout rolling sections – from 10mph to 40+mph back down to 10mph all within half a mile. This made it tough for whoever was driving to match my speed and stay close. This upset me at the beginning because I really needed the headlights for the rough sections of Sicard Hollow. I stayed within the range of the headlights, but not close enough so that I could use the lights to see the nasty sections of road. Instead, I had to rely on my Axiom light set to its maximum power and a knowledge of the location of every pothole from having ridden the road hundreds of times. Everything turned out fine, but I called back to my crew several times (I had my phone with me) to let them know I was displeased. This is all within 5-10 minutes of the start of the race. Once we made it onto the flatter roads of US-78 and AL-25, my speed stayed constant and pretty fast. I couldn’t believe how fast I was flying with what felt like very little effort. As it turns out, there was a nice westerly wind blowing, which my Martindale wheels picked up as a cross-tailwind and pushed me forward incredibly fast. About half a mile before the I-20 intersection, I saw an eighteen wheeler sitting at a factory exit about to pull out. Fortunately, we made it past him just in time, and I sprinted to the next section to the 4-way stop to make sure he didn’t try and pass before the stop. I stopped at the stop sign and then took off again, thankful that they had removed the stop sign on the other side of the bridge and also at the Co Rd 10 intersection half a mile later. We flew along Kelly Creek Rd until I tried to coordinate on the phone our first pee break. After calling to tell Kristine, I found a quiet section of road at the top of a hill in the dark, signaled I was pulling over, and expected the follow car to pull halfway off the road (keep in mind these roads are absolutely deserted!). This was something we hadn’t talked about ahead of time or practiced at all, so Dale didn’t know what to do. I thought they were going to pee, too, but since I was already finished by the time Dale had gotten the car completely off the road in what felt like a parallel parking maneuver, I was already ready to take off again. I told them to hold it and took off. I was not very nice and for that I’m very, very sorry! Looking back, I realized now that I had not prepared either Dale or Kristine at all for what to expect. I just assumed that everything would seem obvious, but that is the problem with riding bikes, doing races, doing group rides, for years and years and years – what seems obvious to me is not going to seem obvious at all to people who have never done any of these things. Lesson #1 learned in the first hour of the race. I kept thinking of the Iron War book and how I am much more like ironman athlete Dave Scott than his rival Mark Allen. Kristine had downloaded that book for our drive up Iron Cross in Pennsylvania last year, and we listened to the entire book on the trip. She had it again for her and Dale to listen to while they were following me. In the book, Dave is described as constantly berating his crew sometimes bringing them to tears, whereas Mark Allen is described with the ability to take everything in stride. As far as athletes go, it seems Dave showed more fire, more raw passion, but Mark internalized and pushed through adversity more on his own without taking it out on his crew. US-231 north and AL-144 all the way to Co Rd 73 outside of Jacksonville were brand new roads to me. We crossed the Coosa River for the first of four times at the Neely Dam. With a nice tailwind, and generally flat roads, I averaged 20.1 mph to the first time station 73 miles into the race in Jacksonville. During UMCA ultra-endurance races, there are several time stations where the crew simply calls in your time at a designated spot using their cell phones. The spot, however, is chosen based on the location of physical land line phones for those racers who choose to do the race without a cellphone. I think that is absolutely awesome. This spot was not too far after passing Cooter Brown’s Rib Shack, which I remembered from this epic adventure climbing ride while Kristine was working in Anniston. In any case, I was flying as we headed north on the 4-lane highway of AL-21. Kristine was happy to report in after calling in the first time split. Shortly before Piedmont, we stopped for another pee break and my crew switched drivers (about 4 hours into the race). Heading north from Piedmont on AL-9 was a fun, rolling road but the temp had started to drop and I was still in shorts and short sleeves. I was getting cold as the temp was in the low 40s by now but opted to wait until the climb from Leesburg onto Lookout Mountain to put on leg and arm warmers. During the climb, I pushed the pace hard wondering if I could get the KOM at a sub-threshold pace. By the top of the climb, it was cold enough I decided to forego the arm warmers and switch to my winter cycling jacket that I had thrown into the car at the last minute thinking I wouldn’t need it. The terrain across the top of Lookout Mountain is some of my favorite terrain for riding – nothing flat and everything is at least 10% up or down … none of this 3-5% flat stuff, which makes for some really fast average speeds but doesn’t give you the adrenaline rush of a 50mph descent or the challenge of a steep climb. 10% up or down constantly means that you are either absolutely flying or crawling, both of which are fun to me. I like the crawling parts because it’s easier to look around and take everything in and think. I like the fast 45-50mph parts because, well, they are fast. Passing through Dogtown, Alabama at 3 in the morning with, guess what, lots of dogs was fun. Also, the county sheriff was sitting at the 4-way stop – presumably looking for drunk drivers blowing through the stop sign. I stopped, waved, and made the turn to head over to Little River Canyon. We probably saw 20-30 county sheriffs or city police throughout the entire race and none of them stopped or questioned us. Little River Canyon – constant rollers, lots of gravel and debris on the roads from the heavy rains and storms the night before. One tree was down blocking the righthand side of the road. This was in a descent around a blind curve, but we made it no problem. Kristine posted the picture I’ve included after the highlights. No view over the side of the canyon, but you could tell that there was a large drop-off, and I could hear loud waterfalls at several points along the route. Also, we saw bunny rabbits hopping away a few times in the grassy sections next to the road. Camp Comer, where Josiah and I spent the night at the boy scout camp for Cub Haunted this past fall was another highlight on the route. We had an absolute blast, so it was fun to reminisce about our time there. We stopped, and I took the pic below which I would instagram later when Kristine and Dale drove ahead to get breakfast for themselves and coffee for me after sunrise near LaFayette. 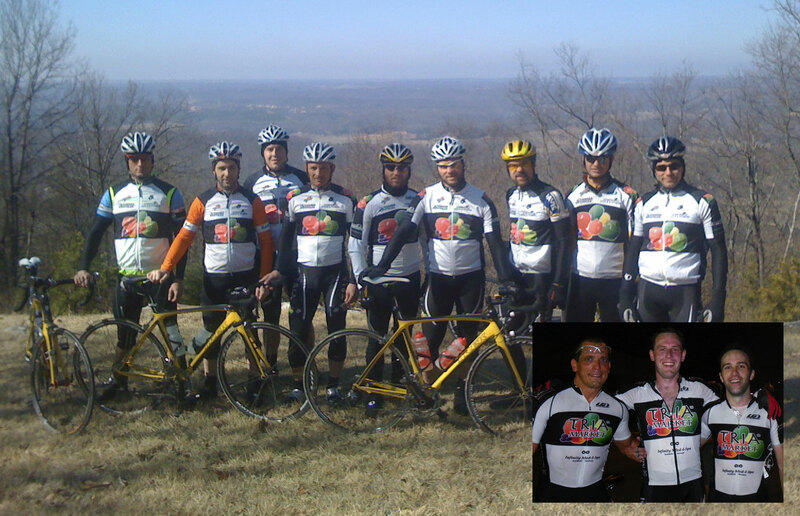 2008 Tria Cycling team on the last day of our winter training camp at sponsor Dan Taylor’s house atop Lookout Mountain next to Alabama’s only ski resort (Mentone). The inset picture is from the Tria Cycling podium sweep of the Cat 3 race at Pepper Place at the end of the season. Left to right: Wes Douglas, Jacob Tubbs, Philip Thompson, Lennie Moon, Mike Lackey, Brent Marshall, Brian Toone (me), Daniel Taylor, and Darryl Seelhorst. Dan Taylor was taking the picture. In the inset from left to right – Sammy Flores, Philip Thompson, and Jacob Tubbs. I stopped somewhere along Co Rd 89 to duct tape my shoes. I had not brought any shoe covers because I wasn’t expecting temps near freezing anywhere along the ride. It’s amazing the difference made by duct-taping all the ventilation holes and also the “worn-out-from-too-many-miles” holes on the shoes. At the bottom of the fast descent off Lookout Mountain, I saw the coldest temps of the entire ride at 32 degF. An hour or two later outside of LaFayette, GA, I instagrammed this pic during one of the sections where Kristine and Dale had left me to go get breakfast for themselves and coffee for me. Wasn't expecting temps in the 30s. Duct tape really is the fix for everything! The water bottle coffee was great for warming me up, but the temps had also started to climb pretty quickly into the upper 30s and lower 40s by the time I made it to Snake Creek Gap about 210 miles into the ride. At this point, I needed to recharge my Garmin. I had a cool on-the-bike charging solution that I will describe later in the equipment section of this post. Georgia is blooming to welcome us! Almost 200 miles done in 10hrs 40min. @kartoone76 is amazing! Time Station 3 was at a Love’s truck stop at I-75 in Resaca, GA. Coming down from Snake Creek Gap with still a bit of a cross-tailwind, I made great time. The wind was clearly coming from the north, now, which I thought was awesome b/c it would mean a general tailwind for the route back home. I knew that the turn onto GA-225 due north towards Chatsworth and Fort Mountain would be brutal. And it was. Strong headwind. The road was rolling so that on some of the steeper downhills, you got a bit of a break from the wind. We took advantage of a porta-potty in a construction area almost directly on the route in Chatsworth for a quick potty break. Towards the bottom of the climb up Fort Mountain, we stopped at a pull-out so I could take off my leg and arm warmers. Temps were still in the upper 40s, but I knew that it would be getting warmer as I climbed for the next hour. Also, I figured the effort I would be putting out would be more than enough to keep me warm on the climb. This worked out well, and the temps had warmed enough by the top I didn’t even need to stop to put any extra clothes on for the long descent. Kristine snapped this pic at the overlook near the top, where I had stopped on my pre-ride of this portion of the course and talked to some motorcycle riders. I knew from my pre-ride the week before that the climb wasn’t steep and that the descent on the backside had lots of short steep uphills. Still, there were some steeper sections of the descent and I maxed out at just under 52mph. Thankfully this was during the day so I didn’t have to worry about staying within the headlights of the follow car. They were quite far behind by the bottom of the steeper part of the descent. Elijay was super busy so we decided for the follow vehicle to head up the road and wait at the next turn. This made it easier for cars to pass, but unfortunately my follow vehicle missed the turn. No worries, though, because I made the turn and after they figured out they had missed the turn, they caught back up to me pretty quickly on one of the hardest stretches of road – GA-382. This was a very hilly section of the course with steep uphills and long gradual downhills (I prefer it the other way around). It was still a really fun section of the course, and we passed a couple sag stops for an organized ride being held in the area. At the end of GA-382 was GA-136, a much flatter but more exposed road. The wind coming out of the northwest was a strong cross-headwind, which is one of the hardest wind configurations to battle with deep aero wheels. Nevertheless, the scenery was nice and I just plugged along until we made it back to Time Station 4. It was encouraging during this difficult section to know that I was approaching 300 miles covered with only 200 miles to go! My longest stop of the day was at the Love’s truck stop (Time Station #4). Shortly before stopping, I saw one of the other competitors pulling away from the time station. I was nearly 100 miles ahead of him! This was my first inkling that I might be really far ahead of everyone else. I still didn’t know where everybody else was, so in the back of my mind I was driven by the thought that whoever was following might roll up on me every time I stopped. By this point in the race, however, I was more than content to change clothes, eat a full sandwich and sun chips, and enjoy the warm sun in the parking lot. Kristine’s post on twitter celebrating mile 300 two hours ahead of a record-breaking pace. At this point I only needed to ride the last 200 miles in 13 hours to break the record. I was a little apprehensive as I went to start riding again that I wouldn’t be able to pedal the bike at all. Lo and behold, my legs, tendons, bones hurt a bit but nothing to the point of making me question whether I could ride 200 more miles. In fact, I was surprised what a little rest did and hit the pace pretty hard — especially since the turn onto the next road meant several county roads all with a nice tailwind. Unfortunately, there were several stop signs through this beautiful tailwind section. There is nothing more frustrating than hammering along with a tailwind (on a downhill no less) and then have to slam on the brakes for a pointless 4-way stop with good visibility. Nevertheless, the rules are the rules, and I stopped at each stop sign. 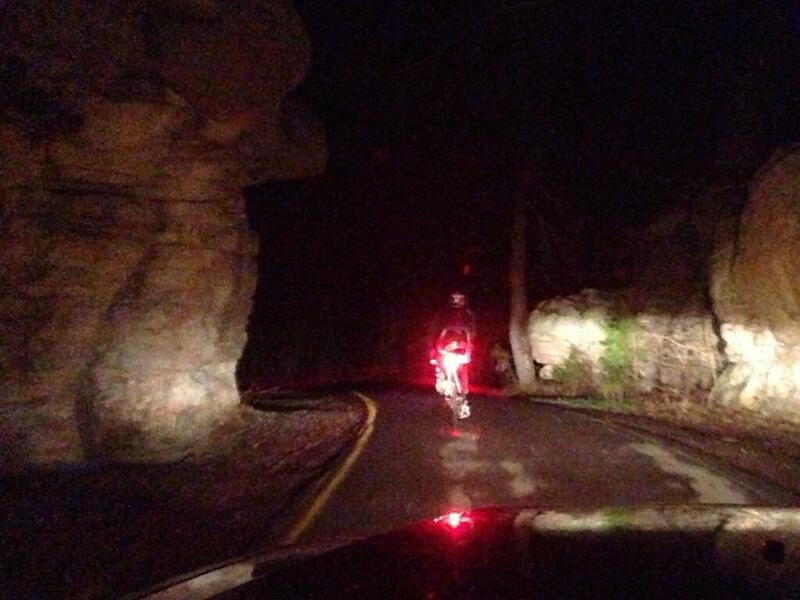 Sikes Story Rd led to Big Texas Valley Rd where we had a bit of a crew miscommunication. Actually, my crew did exactly what I told them to do – head up the road to Friday Rd (the next turn) and wait for me there. Unfortunately, I didn’t realize how long Big Texas Valley Rd was. I ran out of food shortly after they left me, and there was no cellphone coverage to call them and ask/beg them to come back with some food. I did this whole section of Big Texas Valley Rd very hungry and worried that I was hungry with no food. When I made the turn onto Friday Rd, I flew past them and hollered for food angrily even though me running out of food was my own fault. Generally heading south and southeast with a tailwind. Weather starting to get chilly as the sunset. Being disappointed at how far apart the towns of Cave Spring and Cedartown were. Happy to make the turn onto US-278 knowing it was taking me back to Alabama, but then really disappointed with how long it was taking me to get to the small Hardin Rd turn. I kept thinking that each next side street would be the turn to take me across the Chief Ladiga trail and back into Alabama. And then it would be some other random street! Being chased by dogs almost as soon as I crossed the border into Alabama. Welcome to Alabama! The hills on the foothills road race course not being as steep as I remember them. I think that is because the only other times I have ridden those hills is at max effort during a Pro/1/2 road race with a lot of pros. The hills are a lot easier if you can just spin up them easy! An old photo, but 100 miles to go! Like this or comment and Brian will hear the alert in his pocher! And go! This takes us to Mount Cheaha, which I have ridden many times. The road has deteriorated quite a bit over the years. Believe it or not, the road used to be fairly decent chip and seal until one year they decided to redo the chip and seal and did an absolutely horrible job of it (although I think it might have been intentional to try and slow cars, motorcycles, and cyclists down). They put down some horrible chip and seal with too much chip and too much seal. So you have these sharp, rough rocks sealed in place that don’t move. You have to try to find a clean line over them while trying to maximize your downhill speed for the next insane uphill with gradients approaching or exceeding 20%. This was all in the dark, so I relied a lot on my headlight as Kristine again had a hard time staying close enough for her headlights to be much good since she was not allowed to use her high beams at any time during the race. I knew the climbs would be hard, but there were more of them than I remember on Horseblock mountain. I usually approach Cheaha from Co Rd 24, which cuts off a bunch of the steep hills before Horseblock. I thought there would be one or two, but it felt like there were at least five sharp steep hills before even reaching the final steep climb up Horseblock shortly after Co Rd 24. I kept waiting and hoping to see the AL-49 sign because I knew that meant I had reached the Cheaha climb itself which has a few 10% sections, but is much tamer than any of the climbs leading up to it. Across the top, we did a super fast bottle exchange and clothing exchange while pulled off at the state park entrance. Several people camping out at the park hollered encouragement as I biked by at about 9:30PM – probably bikers who were themselves doing the Cheaha Challenge the next day. By this point I was really cold and starting to get very, very sleepy. The first part of the Cheaha descent including the sharp turn onto the Old Cheaha Challenge course to Camp Mac is insane enough to keep you awake, but once I made it through that part of the descent my troubles began. We stopped in Camp Mac for food exchange and to assess everything before the last steep descent off the mountain. I realized how sleepy I was when I fell asleep standing up next to the car. We made it down the final and probably most dangerous part of the descent b/c of the steep dropoff into the river canyon at the last ramp down to the bottom. We made it down OK, and I think the fact that I knew we were down with the last major course obstacle out of the way caused me to relax a bit – which led to the next 67 miles being pretty much absolute hell. There is no other way to describe it. I wanted to sleep so badly yet I knew I couldn’t. I would force myself awake by trying to stomp on the pedals or stand up and pedal (I did a LOT of standing during the last 3 hours of the race). There is no feeling like wanting to sleep, being 75% (or more) asleep, and then being forced awake. That moment of coming back from 75% sleep state is so mentally painful. Rinse and repeat to various degrees and you have the last 67 miles of the race. Before that though, down at the bottom of Cheaha, I was extremely cold, shaking cold. The air temp was still in the 50s but my heartrate was down in the 80s and 90s. I no longer had enough left to push the pedals hard enough to even remotely stress my aerobic system. So with temps in the 50s, I had the following clothes on: shorts, leg warmers, fully duck-taped shoes, jersey, and winter cycling jacket. This still wasn’t enough to keep me warm, so we stopped for me to add a layer — Kristine’s hooded sweatshirt with the hood up over my ears under my helmet — and rearrange the layer order so that my winter cycling jacket was on top of everything since it is more wind resistant. This still wasn’t enough to keep me warm but it was warm enough. In fact, it was probably good that it wasn’t too warm or I probably would have lost my battle to fight off sleep if I had been toasty warm. When we made it to the town of Talladega, we headed straight for the McDonald’s where I sat in the car with the heat blasting while Kristine and her dad went inside to get coffee for me and for themselves (Kristine was half asleep as well). This was our second longest stop of the entire race, but it actually did serve to wake me up a bit. Teenagers were hanging out in the parking lot next to the McDonald’s blasting some music and just having fun. For some reason this was refreshing to me. I have ridden to and from Mount Cheaha from my house a number of times, and the race route followed my preferred route almost to the T so I thought that would be helpful in keeping me awake. It really wasn’t. I was just too sleepy. I think it would have given me physical strength, but I was not in a mental state to really use it. I was just awake enough to pedal in a straight line, make all the turns, and coast on the downhills. In retrospect, I probably should not have coasted the downhills because that led to the following problem: coast sleeping. I’d be awake enough to focus on the downhill and then by the time the road flattened out or started to kick back up again, I would relax, forget to pedal, and come nearly to a stop. The physical act of almost stopping would then jolt me back into being fully awake. It’s kinda sad because I would have absolutely loved the last bit of the race with all of my out/back rides to Cheaha having involved some form of epic adventure or another. I would probably have been in tears so happy to be on really familiar roads, so happy to be so close to being done, reminiscing back to previous epic adventures (e.g., this one on superbowl sunday). Instead, it really was a form of torture, each agonizing minute wanting to be asleep, but forced awake by the road, by Kristine honking, or by the simple desire to push through to the finish. No tears, no reminiscing, just a painful, painful effort to stay awake, to watch out for road hazards, and to not fall asleep. I have short glimpses of sections I remember, but most of them were disappointment realizing some other obstacle. For example, on the Vandiver climb, there are two curve signs – the first one which means you have a bit farther to go and then the sharp turn which means you are almost to the top. I remember a feeling of disappointment when I saw the first curve sign. I don’t even remember the second curve sign, cresting the top, or the first part of the descent. I remember the bottom part of the descent because I knew how dangerous it was and was awake enough to safely negotiate the turns at some ridiculously slow pace. I don’t remember the railroad track crossing or even going through the small town of Dunnavant, but I do remember the steep climb on the Hwy 25 rollers. I kept wondering if the dog in the house on the left, which is rarely out, would be out and chase me down. This led to my next thought, which was of the dogs at the next house on the left which had bitten me over 20 years earlier on one of my first rides on AL-25 – dogs that are probably long dead, but I wondered if they would be out … ghost dogs. I don’t remember the curves before the final descent, but I remember seeing the fog again on Elliot and thinking how 30+ hours earlier, that same fog was forming out of the valley. No recollection of Hwy 119, Zeigler, or Rex Lake. I remember more of the Sicard Hollow section because I kicked it up again after the four-way stop at Grants Mill. I think I stood up from the four-way stop all the way past Liberty Park and never let up on the pedals. It wasn’t until I crossed Grants Mill Rd that I started to wake up again. At this point, the reality started to hit that I only had a few miles left to finish. Whatever adrenaline I had left came back to the surface and that pushed out the sleep. I stood up and hammered the last bit as hard as I could. By the time I made it to the finish, I was much more awake than I had been the previous 50 miles. I wanted to ride back to the house, but Kristine cleared out a spot in the back of the car while I was taking pictures with race director Tom, who had come out to Vandiver to check on us and then taken 280 back to the Colonnade to be there when we arrived. Tom helped me put the bike in the back of the car. I crawled into the car, and Kristine drove the final three miles home. All three of us slept until 12:30 in the afternoon without waking up once during the entire morning. It was probably the soundest sleep I’ve had in years. I was disappointed to have missed breaking the course record after being two hours ahead of it over 300 miles into the race. I was disappointed to be so sleepy after only 400 miles. But then Kristine pointed out that I had not slept at all prior to the start of the race at 8PM. In a normal race starting in the morning, I believe I would have made it the full 500+ miles without the same sleep issues. Also, I was looking back at the reports for when the record was set in 2005 and 2006. Back then, they were able to choose a start time, with Chris MacDonald choosing 7AM for his start time in 2005 and Tinker Juarez choosing his start time of 5AM in 2006. This means both of them had a somewhat normal night of sleep immediately ahead of the race. I, instead, had a normal work day prior to the start of my race! I feel very confident that I would have either broken the record or come much, much closer to it without all the sleep problems. Garmin Edge 705 – sometimes in my pocket, sometimes in the follow car. Did not end up needing any of this data. I do not like taking any kind of medicine at all because I simply do not like medicine. So my body is super sensitive to pain medication. I took two alleve about an hour before the start of the race. About 18 hours later sometime around mid-day when my body was starting to hurt a bit, I took two more alleve. That is the only pain meds I took during the race. Nothing after the race, and I didn’t really start to feel any kind of major pain until late afternoon on Sunday after waking up from sleep. Two more alleve on Sunday afternoon. One on Monday morning, and none since then. Everything is back to normal. As far as nutrition goes, I stayed on top of it for the first 12-16 hours of the race eating a powerbar harvest bar (250 calories) at least once an hour. I really like powerbars, but it turns out that there really is a limit to the number you can eat. Sometime after Fort Mountain, I didn’t want to eat any more powerbars. Kristine had a whole bunch of panera bagels and cream cheese – so she made three or four of those over the next several hours. I also started to rely more on the caffeinated powergels and gu roctanes. In addition to all of that, I didn’t drink any water during the entire race – it was all orange gatorade and orange powerade. That adds another 150-200 calories per hour. At the Love’s truck stop (time station #4), I had a ham and cheese sandwich and half a bag of sunchips. Late in the race I was craving salt, and Kristine got me something that was pretty salty but I was half asleep and don’t even remember what it was now. Altogether, Strava calculates from my Quarq power meter that I did 20,307 kJ of work during the race and burned 22,643 calories. I would suspect that I consumed somewhere in the neighborhood of 10,000 calories. I had a really light riding week leading up to the race and ate a lot so I had gained weight — all the way up to 149 pounds shortly before the race start. I forgot to weigh myself after the race, but a week later and after eating everything in sight all week, I’m still hovering around 144 pounds, meaning that it is safe to assume that I lost more than 5 pounds of non-water weight during the race. Unfortunately, I suspect that at least a pound of that was muscle but hopefully the rest was fat. Plan, prepare, and communicate. They say that one of the hardest things about RAAM is the crew. Not only do you have the logistics to deal with, but you also have people having to endure a lot of sleeplessness and boredom. The more I can prepare people for what to expect, the better. I’ve got to stay on top of sleep. My general plan for the race has been to sleep less at the beginning and more later, but I’m not sure that’s such a good idea. I’m thinking more along the lines of 500 miles riding, 6 hours sleep, 500 miles riding, 6 hours sleep, etc… This would put me across the country in approximately 180 hours + 30 hours sleep = 210 hours = 8.75 days = a really good time for RAAM, certainly nowhere near the records of under 8 days, but also still the possibility to place well in the 2015 results while getting a sane amount of sleep each night. Nutrition is going to be tricky. I should probably mix more in than just powerbars from the beginning. My go-to food can be powerbars, but I should alternate in bagels, salty things such as trail mix, and other non-bar items so that I don’t get sick of powerbars so quickly and not be able to eat them anymore. Garmin charging setup worked really well. I’ll plan on doing at least one 500 mile leg in a single Garmin file just to see if it can make it, with backup options in case the Garmin crashes. My solar battery pack is really light and fits well in my back pocket. I have a green mini-usb cable that can reach out of my back pocket and up to the handlebars to charge the Garmin while I ride. It never came unplugged at all while riding, and it didn’t interfere much although the cable would bang into my leg very lightly with each pedal stroke. I got used to it after a few minutes. I need a hands-free set for my phone. It was annoying having to fish my phone out of my pocket, especially at night with long finger gloves. A hands-free set would simplify everything and allow for more constant contact with the crew. Also, I’m going to need to think of a good charging solution or battery pack for the phone, possibly a second solar battery pack as they are so lightweight. One more time, the map of the course overlaid on the raised relief maps of the southeast that I’ve had up for years on my wall in the basement – the entire course fits on the map! This entry was posted in Adventure, Racing on April 13, 2014 by kartoone. Your perfect for RAAm. Nobody puts in more miles or climbing. Good luck and ding forget to sign up. That’s the hardest and most important part.